I live in lower Sukhumvit, there’s always a lot going on, always. Traffic, sidewalk venders, street food, tiki bars, DVD’s, motocye driving on the sidewalk, t-shirts, neon, lady boys, bars, cafes, traffic, friendly tuk tuk drivers, it’s all here, all the time. Many laws are bent and broken, it’s not unsafe, rules are followed, not laws. Rules like, if you want to keep your sidewalk bar open all night instead of closing around 4am, the right payment to the right person ensures the right people look the other way at “closing” time. Laws like ‘no street food on Mondays so the sidewalks can be cleaned’ are only observed if someone didn’t get the right envelope. Lower Sukhumvit- from around Soi Nana to Asoke- has loads of people, loads of places to partake and very little enforcement. I was surprised to see a fence had been erected in the median under the BTS Skytrain, the fence is designed to prevent Jaywalking, something I didn’t realize was a major concern along Sukhumbit. I was even more surprised to see signs detailing a fine for Jaywalking. Who is going to monitor Jaywalking with all that is happening? If any fine is ever paid, the Jaywalker should consider it a donation to the collector, not a fine. I’ve got 200thb that says the signs are gone before the rainy season ends. 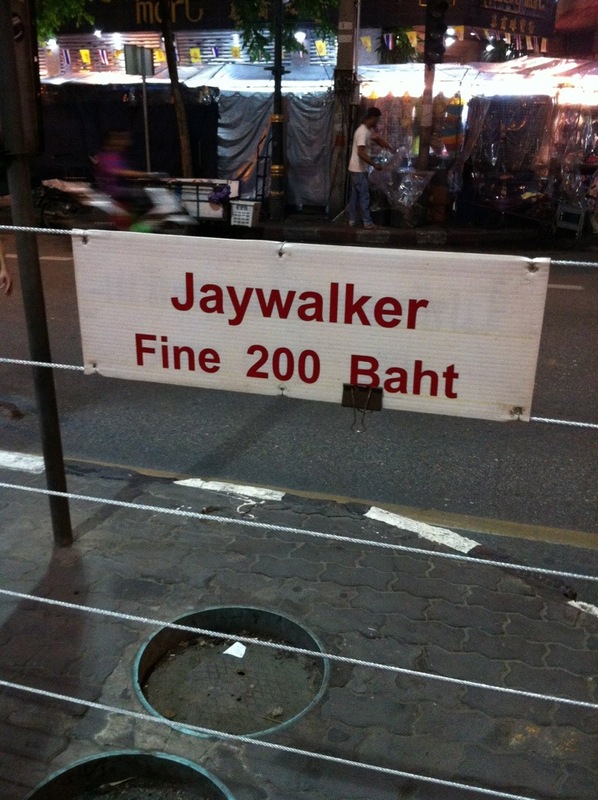 This entry was posted in Farang and tagged Jaywalking, Sukhumvit. Bookmark the permalink.